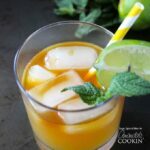 This simple and basic Mai Tai Cocktail recipe is easy to make and has delicious mix of almond, lime, and tropical fruit flavors. Great for summer! You can layer or shake this recipe - there really is no way to go wrong. For ours, I added the orgeat syrup directly to the glasses before adding the ice. I poured over the rum, lime juice, and then fruit juices before garnishing with a slice of lime and a mint leave. This recipe for Mai Tai Cocktail was printed from AmandasCookin.com - https://amandascookin.com/mai-tai-cocktail-recipe/ and can only be printed for education or personal use.